White House principal deputy press secretary Hogan Gidley told Breitbart News Daily Thursday that Sen. Bernie Sanders’ (I-VT) Medicare for All plan amounts to a “complete and total joke,” whereas Republicans will offer a plan that will lower healthcare costs and offer more options for the American people. 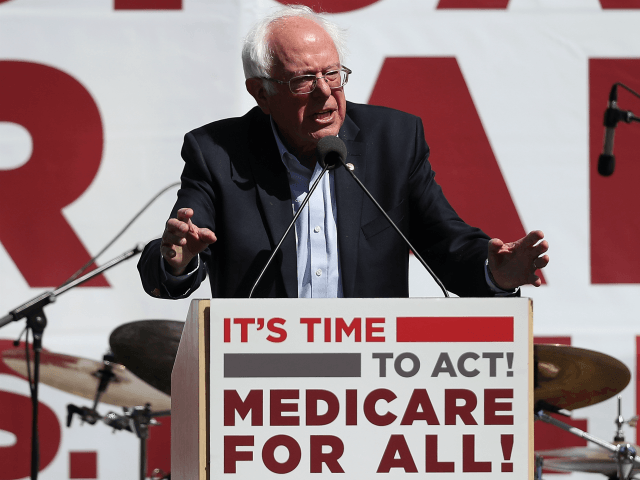 Sen. Sanders re-unveiled his Medicare for All plan this week, which would eliminate private health insurance for Americans and replace it with a single-payer, government-run healthcare system. Some analysts have pinned the price of Sanders’ Medicare for All plan as high as $38 trillion over the next ten years. Gidley said Sanders’ plan amounts to a “complete joke and total joke” that will cripple the economy. In contrast to Sanders, Gidley said that President Donald Trump will offer “realistic solutions” that will increase healthcare competition and offer more choices. President Trump said the GOP will become the party of health care and deliver a better alternative to Obamacare and Medicare for All. The Trump administration also backed a lawsuit that would eliminate the entire Affordable Care Act (ACA). Gidley noted that, under Medicare for All, 58 percent of the federal budget will be dedicated to health care, and Americans will not receive high-quality care. The White House deputy press secretary noted President Trump and Congress have already delivered on health care in many ways, such as repealing Obamacare’s individual mandate, which Gidley contended was Americans’ “biggest issue” with Obamacare. President Trump also expanded short-term health insurance plans and Association Health Plans (AHPs) through an executive order that offer more affordable healthcare options compared to Obamacare. Further, Gidley suggested that Trump lowered drug prices by allowing “broader usage” of generic drugs. Gidley concluded, suggesting that Americans will choose the Republican healthcare plan over Medicare for All every single time. “When the American people take a look at the two plans side by side, one that strips away your ability to have private health insurance, kicking 180 million off coverage versus a plan that provides a better plan that gives them a better choice and lower prices and more freedom as a family, they’re going to pick us all day long, I can promise you that,” Gidley said.